Taekwondo is Action Philosophy. It is the Korean art of self-defense and official Olympic sport. Literally translated, Tae means the kick of strike with the foot, Kwon means fist or to strike with the hand, and Do means a nonviolent art and system of complete body exercise as well as a way of life. It includes physical techniques, mental discipline and deep philosophy. By practicing Taekwondo, one can benefit in these ways. One can develop good coordination, gain strength, increase flexibility and improve cardiovascular conditioning. From all these physical practices, one can have a strong body. One can build self-confidence, gain better judgement and improve self-control. From all of these mental disciplines, one can have a strong mind. While developing a strong body and a strong mind, it is appropriate to learn the valuable tools and lesson in life ordered by the Taekwondo philosophy. Incorporating these three aspects into one's life will build for them the ability to be strong, humble, gentle and to maintain self-respect. 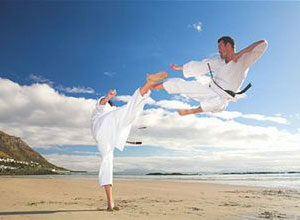 Taekwondo philosophy emphasizes good health, happiness, generosity and a sense of value of freedom, justice and peace. All of these inspire both independence and coexistence. Taekwondo is an art of humanity. It is a guide for the information of outstanding character. It is practiced as a modern world sport. It is useful as a contemporary universal philosophy. The utmost respect must be given to one's country, flag, parents and Taekwondo instructor. Courtesy and respect should be extended to all fellow humans and particularly to those of older age. Taekwondo students are expected to be humble about their accomplishments. Bullies and braggarts have no place in Taekwondo. One should have a quiet feeling of pride in their achievements, but not feel compelled to advertise these accomplishments. One should be never lose his or her temper. One's skills are seriously diminished if control over emotions are lost. 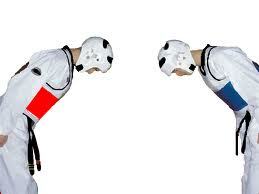 Moreover, one should never use Taekwondo except in self defense. It is normal to become discouraged occasionally, particularly when pursuing an activity sufficiently challenging to be truly worthwhile. However, one should perserve until mastery is accomplished. Never quit, never give up. This is an expansion of all the points in the Taekwondo doctrine. A Taekwondo person should use their skills and education to fight injustice. One should strive to overcome personal weakness in all area of life and be a credit always to himself or herself and their sport.